The dictatorship's Attorney-General, Aiyaz Sayed-Khaiyum, is quite clearly suffering from Foot in the Mouth Disease, which is evident from his verbal defecation following the United States refusal to grant illegal Chief Justice Anthony Gates a visa. Gates was to attend the 9th Session of the Assembly of States Parties to the Rome Statute of the International Criminal Court, at the United Nations headquarters in New York. 1) Sayed-Khaiyum claims Fiji has made progress to ensure compliance with the Rome Statue through promulgation of the Crimes Decree, which now categorises genocide and crimes against humanity as criminal offences. It is a case of pot calling the kettle black. The regime continues to trample on fundamental freedoms and human rights in Fiji, protected by unlawful Decrees that are being legislated by Sayed-Khaiyum. 2) Sayed-Khaiyum says Fiji, as a responsible sovereign State, takes international obligations and responsibilities with utmost sincerity. His lie is as visible as his fake personality. What about the betrayal of commitments from the regime via Sayed-Khaiyum, M P Chaudhry and Epeli Nailatikau, made in April 2007 to the European Union to hold elections in Fiji by March 2009? What about a similar commitment for elections to be held by first quarter of 2009, made by dictator Frank Bainimarama to the Pacific Islands Forum in October 2007? Can Sayed-Khaiyum say that as a sovereign State, the regime that he serves took these responsibilities and obligations with utmost sincerity? 3) Sayed Khaiyum is assuming the United States Embassy will give insufficient time for visa processing as the answer for the refusal! On what basis is he making this assumption? 4) In his attempt to dramatise the issue, Sayed Khaiyum has revealed that he along with the regime's permanent secretary for Fisheries, were also refused visas to travel to the United States this year. Why was Sayed-Khaiyum quiet all this time? 5) Sayed Khaiyum has labelled the US stand deplorable, undignified, demeaning, arbitrary, arrogant and contemptible. This is the harshest language ever used to criticise a member of the international community, and one who has been Fiji's ally. Do Sayed-Khaiyum, Frank Bainimarama and the military regime therefore have the guts to walk their talk and inflict upon the United States, the treatment that they dished out to Australia and New Zealand for so-called interference and visa related issues in conformity to their sanctions, by expelling their diplomats? In June 2007, the regime expelled NZ High Commissioner Michael Green on the basis of interference, which the regime did not specify. In December 2008, the regime expelled acting NZ High Commissioner Caroline McDonald after the son of then permanent secretary to the President (Iloilo) Rupeni Nacewa was refused a student visa to study in New Zealand. 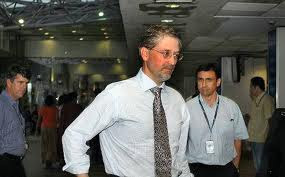 In November 2009, the regime expelled deputy NZ High Commissioner Todd Cleaver and Australian High Commissioner James Batley after accusing both countries of telling Sri Lankans recruited as magistrates and judges by the regime that they would be subjected to travel bans to New Zealand and Australia. In July this year, the regime expelled Australia's acting High Commissioner Sarah Roberts after accusing her of interference and of influencing Vanuatu to refuse to hand over of the Melanesian Spearhead Group chairmanship to Frank Bainimarama. The decision by the United States Embassy to refuse the regime's CJ Anthony Gates, Sayed-Khaiyum and permanent secretary for Fisheries travel visas to United States is far more serious on the regime's anti-Fiji behaviour measuring scale. We will wait and see if the regime and Sayed-Khaiyum dish out similar treatment to US Ambassador Steven McGann and kick him out like five diplomats from Australia and New Zealand, or show the world that the strong condemnation of the US is just showmanship and verbal defecation. Our final assessment is Sayed Khaiyum will eat his own vomit and come up with excuses to explain his harmless barrage of attack against the United States. Pictures: Sarah Roberts (top) and Todd Cleaver (below). Prime Minister Bainimarama, please kick out the US Embassador ASAP. Dont let them pass a no confidence in our Judiciary and our government. kick them out.Now. Pigface illegal AG has no guts to deport US ambassador. Outright LAMUSONA. He is actually shooting in his own foot. He cant get assylum in Aust & NZ, now the US has closed the door on him at a time when the noose is tightening. You will get what you deserve, only a matter of time. You illegal lot might like to revisit Dec 06. The majority supported you back then, and in your wisdom, you silenced them with decrees, PER, media restrictions and lies. The only support you have, an insignificant one though, is from Sharon's sidekick, the dickhead from Horowhenua, New Zealand. some people in this blog site are blind. cant see the reforms put by AG and PM. please give them some credit. Fiji will be represented so what's the big deal? The US is an expert in playing with small and economically vulnerable countries and go to the extent of creating wars - need I say more? The impact of US's dirty dealings are staring at them from all corners of the world and locally, within the US itself. The US, along with Australia and NZ are now worried with Fiji's receptive response to China's interest in extending her power to the Pacific, a region that has always belonged to the western world, but now, threatened by Fiji/Asian friendship. And, to top it all off, the US is broke and totally dependent on China! What part of "you are not getting visas to the US" do these feral military retards not understand? Speak to your boss khaiyum - he might arrange for you all to get a one way ticket to some other rogue states and dictatorships like iran, burma, north korea or zimbabwe? Or Mr gates could always get you to sri lanka - that's a nice place with a big export market for its magistrates to Fiji's human rights abusing regime. Current definition - "unobtainable by current regime - anywhere". Dipolmacy at its best is now hurting people who 'want the cake and eat it' so to speak. Being an 'illegitimate child', you cannot, for one moment, humiliate and kick big brother , who is legitimate and stronger, out from your home and then expect him to welcome you into his home. Neither can you do the same to his "legitimate" cousin[s]!! They are sure to gang up on you. This is what is happening now, and more is to come, by the way. People should 'bite the bullet' and be graceful. One reaps what one sows. If you want respect, you should first respect others. Give credit to the military regime? Having regard to what they have done over the past four years, they deserve no credit and little sympathy for their lies, their treachery and their ongoing incompetence. History will be their judge and will judge them harshly for the stupidity they have wrought on our nation. Currently, the RFMF and its Soldiers are the laughing stock of the Pacific ! On the 10th. they will have one chance and one only, to prove everyone wrong, by arresting Frank Bainimarama and aiyaz Sayed Khaiyum and their supporters. ! Surely by now you will have known that the R[a] F[ucken] M[other] F[uckers]are a bunch of insignificant and bunch of school drop-outs with pea [pee] brains like their boss. They lack the depth and do not have an iota and understanding of what 'Moral Courage'means. As opposed to former "Officers & Gentlemen" you now have "Dictators, Murderers, Scumbags, Playboys, MoneyLaunders" and all the evil that SATAN stands for! !